What is it about little girls? They’re spooky. Headstrong. Probably possessed by spirits or intergalactic alien intelligences. Like cats, they’re entirely too curious. They’re the epitome of innocence. Yet they know far more than they’re letting on. There’s nothing scarier than a dead one coming back to life. Unless there’s two of them. They see things nobody else can see. Or so they say. Adults never believe them. Nor should they. If we all lived inside the heads of little girls? Saw what they saw? Knew what they knew? I shudder to think. In this week’s Mind Control Double Feature, we get taken for a ride by two little girls into the myths of their respective cultures. In one, the myth is simple and straightforward. The other is so full of colliding mythic beings there’s no use even trying to figure out what’s what and who’s who. 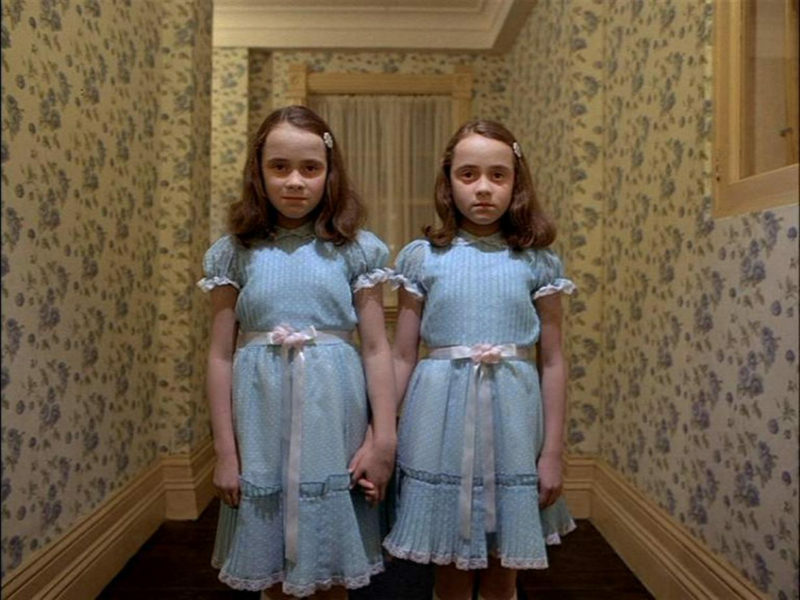 In both, the little girls take no guff from anyone or anything. Nothing throws them. They plunge in, no questions asked, and show us how best to take on the weird. Fiona is a little Irish girl. After her mother dies, her father takes her and her older brothers to the city, a nasty place for a sweet little kid. Or in this case, a very serious little kid. So dad packs her off to live with her grandparents in a fishing village, across the water from which lies the tiny island of Roan Inish, where Fiona and her family used to live. 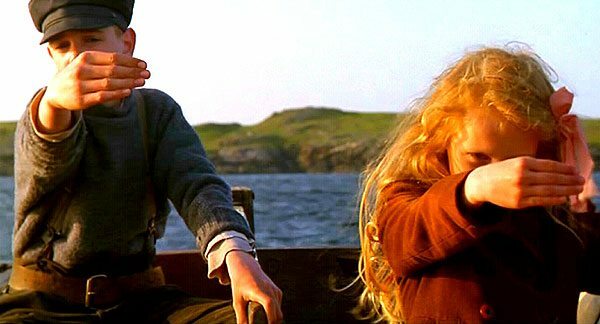 At some point in the past, when Fiona was very young indeed, everyone moved off of Roan Inish, leaving it abandoned. 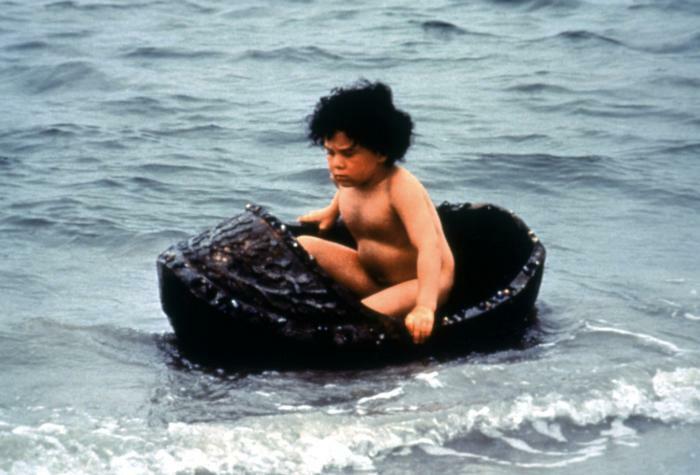 When they did so, her baby brother, Jaime, sitting in the tiny boat-like crib made by his great great great great grandfather (or so), is swept out to sea and lost, seemingly with the collusion of the island’s seals and birds. 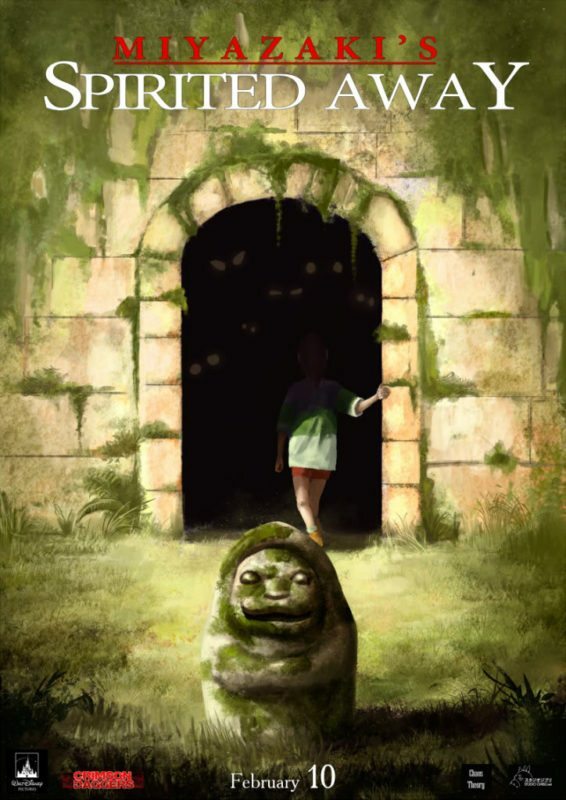 Though told not to talk about the past, Fiona talks about nothing but the past. She gets her teenage cousin Eamon to take her out to Roan Inish. Does she see an older Jaime wandering about and chilling with the seals? I think you know the answer to that. Does anyone believe her when she tells them what she’s seen? Did she really see what she saw? Jaime in his crib, raised by the seals. She meets another relative, a young man said to be “touched” in the head, who tells her the story of how, long ago, one of the men in their family was almost lost at sea, and how he (or is it his son? so many relatives in here), a loner, comes upon a selkie who’s shed her skin. And what’s a selkie? Sometimes a seal, sometimes a woman. Should you steal a selkie’s skin, and keep it, she will stay with you, and so this young man takes the sealskin and marries the woman. Many stories are told in The Secret of Roan Inish, a potentially dangerous thing to do in a movie. You don’t want to lose the story of the movie in the telling of other stories. But writer/director John Sayles makes it work. The movie is slow but never boring. There’s no outsized emotion on display. As is the case with all of Sayles’s movies, there are no stylized visuals (though as shot by Haskell Wexler, it’s a beautiful movie in urgent need of a remastered blu-ray release). It’s a very simple tale, told simply. An aura of dreaminess pervades the movie, not making what happens unreal, but giving it a kind of story-book vibe. Which makes sense, the movie being based on a story-book, The Secret of Ron Mor Skerry, which makes for an admittedly non-catchy movie title. Roan Inish has a bit more poetry to it. 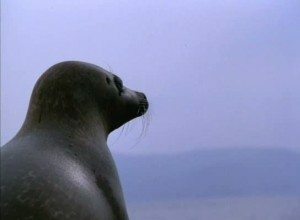 Also of note: if you like seals, those weird whiskered floppy dogs of the seas, this movie is for you. I suppose seals are known for being very trainable, but man, these seals in here are killer actors. Fortunately the human actors are equally skilled, especially Jeni Courtney as Fiona. 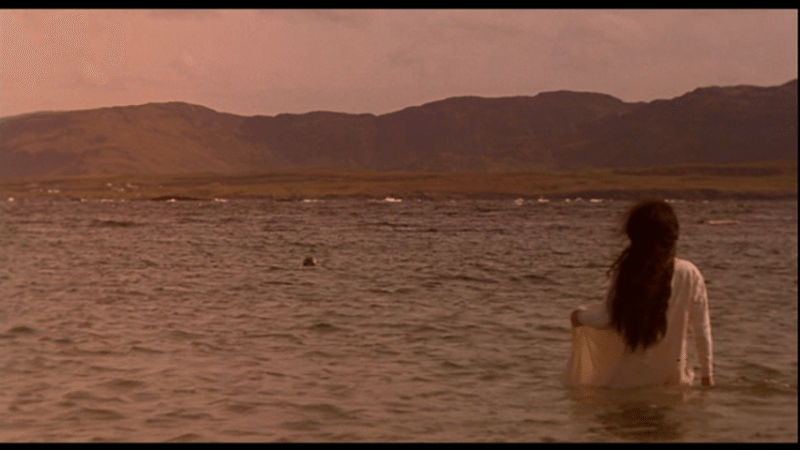 The Secret of Roan Inish is a mythic story unadorned and matter-of-fact. Its simplicity is what pulls you in. This week’s second feature does things a bit differently. Chihiro is a little Japanese girl. She’s ten years old and not happy at her parents having moved to a new town. On the drive there, her curious father takes a wrong turn into the woods. 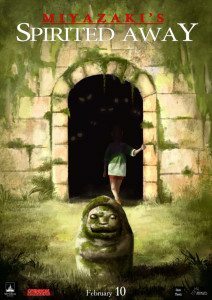 They walk through a tunnel, over a meadow, and into an abandoned kind of fairgrounds. They stay too late. The lights come on. Strange creatures appear. Her parents sit at a foodstall. Food appears, tons of it. They gobble it down until they turn into pigs. 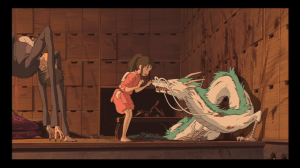 Chihiro finds a strange bathhouse into which peculiar creatures pour, and a boy, Haku, who tells her to flee before it’s too late. It’s too late. Chihiro is stuck in the spirit world. So, like you do, she gets a job at the bathhouse, servicing weird gods and spirits and whatnot, creatures I assume stem from Japanese myth and folklore, though I’m not up on such things enough to be sure. 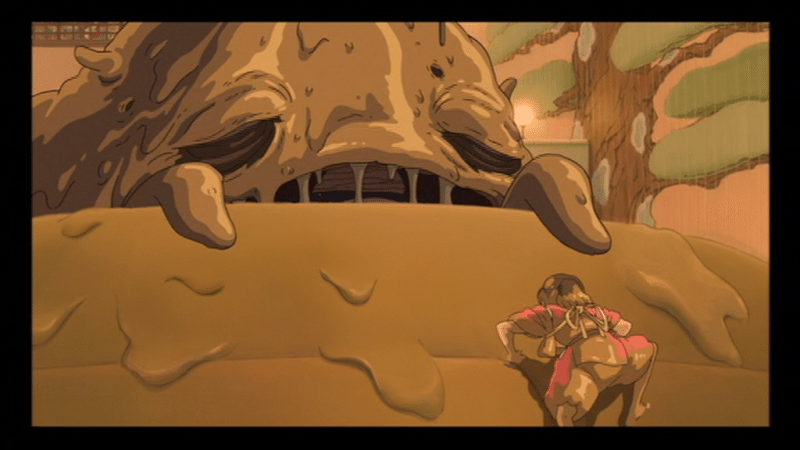 In any case, the creatures running the bathhouse and using its services are fantastically weird and imaginative. Did I mention this is an animated movie? You might have heard of it. It made eleventy bazillion samoleons all over the world when it opened. In Japan, it outgrossed Titanic, a movie about Leonardo DiCaprio flying a magical boat to heaven, where it sinks and turns into an old lady. 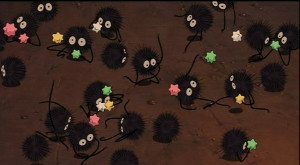 It is, to my eyes, Japanese animation master Hayao Miyazaki’s best movie. 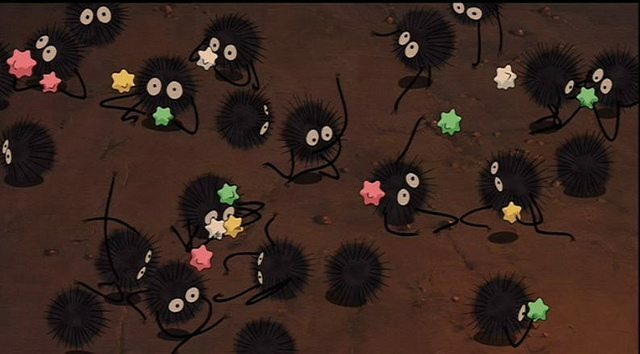 My favorite characters in the movie are the little coal-carrying sprites. I want them as pets. I will name all of them Larry. They will be my friends. Ahhh! Come here, little friends! So anyway, I’d describe some more plot for you, but yikes, good luck describing the plot of this thing. Suffice to say, there’s a witch with a very big baby and these awesome bouncing heads who Chihiro has to deal with, and she does, quite effectively, as is the wont of stubborn little girls in mythic stories. Chihiro also does a bang-up job in the bathhouse, eventually taking care of a very unpleasant fellow named No-Face who goes around eating everybody and spewing chunks of gold from his flesh. This movie is a story about a 10-year-old whose father and mother happened to eat something they shouldn’t have, and so became pigs. The movie appears to be satire, but that isn’t my purpose…it’s not a story in which the characters grow up, but a story in which they draw on something already inside them, brought out by the particular circumstances… I wanted to tell such a story in this movie. I want my young friends to live like that, and I think they, too, have such a wish. For me, a bath house is a mysterious place in town. The first time I saw an oil painting was in a bath house. And there was a small door next to the bath tub. I wondered what was behind that door…It would be fun if there were such a bath house [for gods]…Japanese gods go there to rest for a few days, then return home saying they wished they could stay for a little while longer…I was thinking that it’s tough being a Japanese god today. Miyazaki’s animation style is all flowing and gloopy, let’s say. Or, okay, I’ll say it and you can look at me sideways. It’s best not to describe it, better to watch it. If Spirited Away resembles anything, it’s Alice’s Adventures in Wonderland and Through The Looking Glass. And like those masterpieces, it’s just as enthralling for adults as for kids. Maybe more so. Kids are already kids. Their lives are just like this! We old folks need the occasional reminder that life is what you imagine. Both great films. 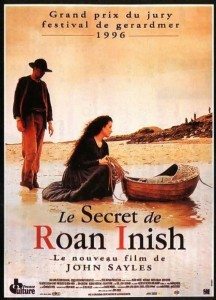 Roan Inish kind of slipped through the cracks for a lot of people but it’s worth watching. For my money, I think My Neighbor Totoro is Miyazaki’s best. But there are so many great ones it’s hard to say. I got tired of all the crap movies my nephews were watching in their (and their parent’s) defence I was the one taking them to see the latest Marvel movies and getting all the latest crappy kids movies for them to watch. It’s pretty tough finding genuinely engaging good kids movies. So I got a bunch of Miyazaki films for them for a number of reason the main one being that they have female protagonists and they don’t resort to the myth of redemptive violence. I’m so tired of every movie ending with a fight. My Neighbor Totoro was the first one we watched, they were a bit apprehensive at first because they didn’t recognise the characters from a TV show or action toy they had seen but after about 10-15 mins they were glued to the screen and they still talk to me about it. We still haven’t watched another yet though. We did watch Akeelah and the Bee, they loved that too. Well, this double bill should keep them entertained. 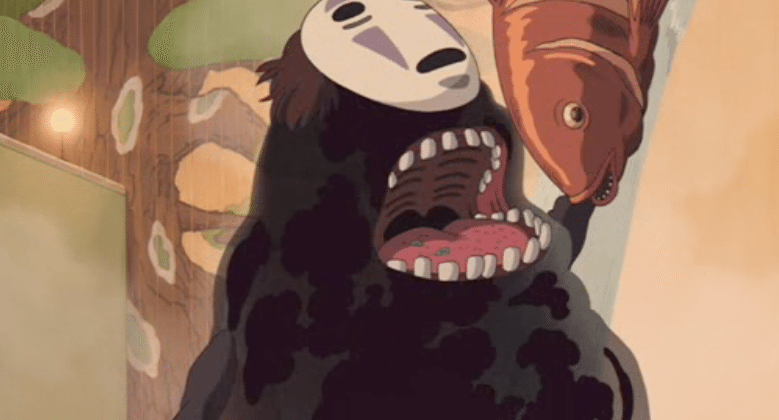 But yeah, really anything Miyazaki will be enthralling for a kid.